Quitting smoking is not an easy task to handle alone. Every day, thousands of people deal with cravings and habits associated with quitting smoking. When people quit smoking, they could be doing it for many reasons. Maybe it’s just one: to live longer. If you’re not aware of the side effects of smoking cigarettes, then you should really spend some time to research what you put in your body because the end result is death. A horrible, painful death from a great list of medical conditions, including emphysema, chronic bronchitis, and cancer just to name the top killers. If you have decided to quit smoking, you have probably made the best decision of your life. The doctors at our clinic in Miami are fully aware of the side effects of smoking tobacco. 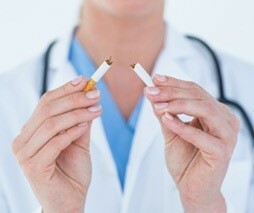 Call (305) 776-2898 to schedule an appointment with our doctors to see how we can help you with quit smoking medication. You should quit smoking because it will save your life. However, for some people, quitting smoking is probably one of the hardest things to do. This is based on the nicotine withdrawal symptoms associated, such as mood swings, irritability, cravings, headaches, and sleep apnea to name a few. Cigarettes contain many different addictive and harmful chemicals, including: acetone (solvents), ammonia (cleaning agent), chromium (wood preservative), formaldehyde (foam insulation), hydrogen cyanide (plastic), lead (metal alloys), toluene (resins), nicotine (addictive and an insecticide), and carbon monoxide (car exhaust). Luckily, there is a medication that can help you quit smoking. How Can Medication Help You Quit Smoking? While the health concerns associated with smoking cigarettes continue to grow, research on quit smoking medication has also continued to grow. Recent research has found that medication can benefit users who have decided to quit smoking. Medication can help people with cravings and withdrawal symptoms. When you decide to quit smoking, a medication from our doctors can help you get back to feeling normal and without cravings for nicotine. To learn more about using quit smoking medication, call our clinic in Miami at (305) 776-2898 or click here to schedule an appointment with our doctors today.